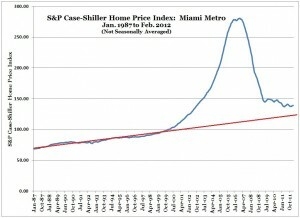 According to the S&P Case-Shiller Home Price Index, prices in Miami have been in a narrow, flat channel for about one year now. A similar pattern held from 2009-2010 before slipping to the current level. 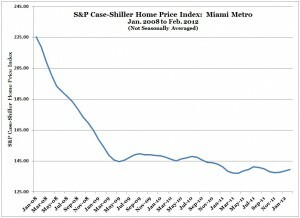 The difference between the current level and the 2009-2010 level is about 8 out of 145 Case-Shiller index points. 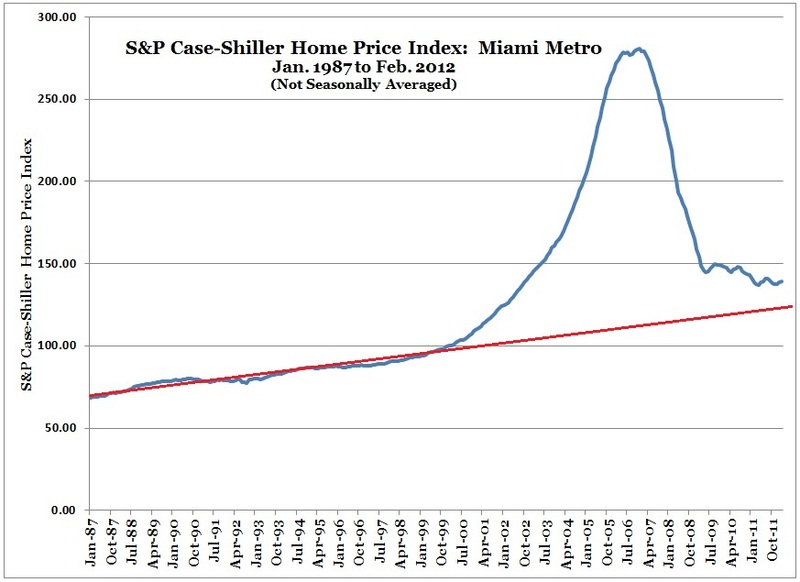 That’s almost exactly the same proportion (8 out of 145) that the government’s $8,000 home buyer tax credit in 2009-2010 bears to the median home price in Miami, which stands at about $145,000. Could be a case study in the economics of temporary government intervention. 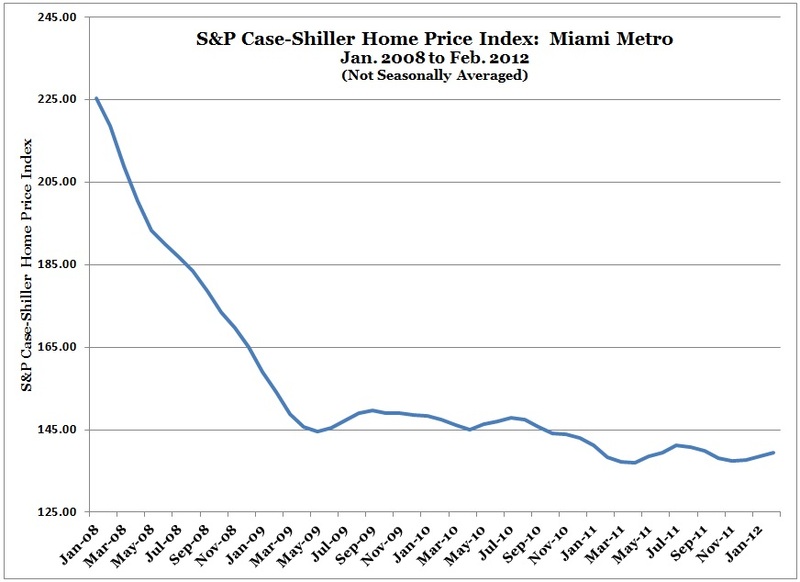 It’s just a coincidence that the Case-Shiller index level is close to the median home price. The index level does not signify dollars and cents, but the relationship of current prices to the level in January 2000, which is assigned an index level of 100.00. The current index level of 139.49 means prices today are 39.49% higher than in January 2000. Not bad, and indeed it represents annual compound appreciation of 2.77%, which is actually below the 2.95% rate of appreciation from 1987 to 2000, which suggests that current prices are reasonable as a matter of long-term appreciation. The S&P 500 index closed at 1455.22 on the first day of trading in the year 2000. It closed at 1391.57 yesterday. That’s annual compound appreciation of -0.36% (i.e., depreciation, not appreciation). Of course, January 2000 was close to the top of the biggest stock-market bubble of all time, and was before the real-estate bubble was created (yes, intentionally, and precisely to offset the bursting stock-market bubble). Picking a different time frame would tell a different story about real estate versus stocks. And a truly accurate comparison between real estate and stocks would be more complicated than that, taking into account dividends, income taxes, property taxes, insurance, rent avoidance, etc. On the other hand, a trendline accurately adjusted for the effect of compounding would curve gradually upward. If the Case-Shiller index had continued rising at its 1987-2000 rate of 2.95% instead of booming and busting, its current value would be about 142.50. In that sense, prices have already overshot to the downside by a few percent.